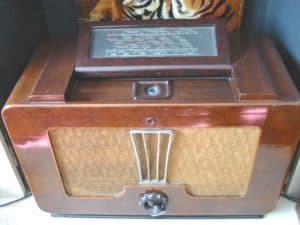 The meaning of “Restoration” of a vintage radio is a very open term. It could be taken that the bare minimum is done to get the set working to a full chassis and cabinet overhaul, bringing the set to as near “as it left the factory” condition. Of course, the end result very much depends on the condition of the set when presented and the depth of the owners pocket. In my opinion, one thing to always pay attention to is the safety to the user of a vintage wireless when being used on the mains. Attention to areas such as mains cable, capacitors and making the owner aware of the possible problems with AC/DC sets are paramount. An owner can obviously dictate what requires to be done to a set. Once work has been carried out as per the owners’ request, a summary report will be provided setting out limitations and any recommended remedial work. In order to set some ground rules as to what work would typically be carried out when someone brings in their treasure for a standard overhaul, I have set out below what would be done. Mains cable checked and replaced where required, paying attention to live and neutral connections. Internal cabling checked and replaced as required. Manufactures such as Philips used rubber coated cables. The rubber coating becomes hard and brittle over the years and eventually breaks away from the wire, resulting in potentially dangerous and damaging situations. Most sets made in the UK suffer from the dreaded HUNTS wax coated capacitors. Over time, these components fail and take on a resistive quality causing distorted sound, early death of other components and valves, low sensitivity, smoke etc…. This type of capacitor is normally used in coupling and decoupling areas. As matter of course, they would be changed. HT electrolytics normally fail and cause hum, instability, smoke and damage to power supplies. If these components show signs of aging, they would be replaced. Unlike the components in 1. above, they would not necessarily be condemned at first sight. In sets dating from around the 1930s, HT reservoir and smoothing capacitors took the form of a cardboard box. Where possible, the outer form would be kept and the insides replaced with a modern equivalent. This keeps the appearance traditional. Mains filter capacitors are changed as a matter of course with X2 type components. Small value pf mica capacitors in the tuning and RF section are not normally required to be replaced. Sometimes they can become intermittent and change value when warm. The result is normally a loss in signal strength and or a sudden move in the station on the tuning scale. Normally these components do not cause upset, except where used in power, output stages etc. The values would be checked and replacements made where required. Sometimes faulty carbon resistors cause noise and intermittent problems. A shot of freezer gas normally finds the culprit. Decks normally seize up with grease and oil becoming hardened. 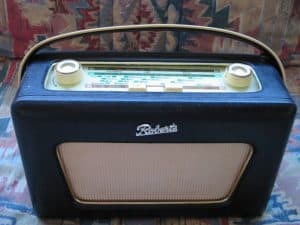 The location of the deck quite often is above the radio / amplifier section with the heat off the valves adding to the discomfort. Cleaning fluid and careful application of specialist grease solvents and re packing bearings with long life grease normally cures the problems. Idler wheels become hard, resulting in slipping turntables when then auto-change mechanism kicks in. If available, the wheels are changed, but these are becoming hard to find. A get around can arrived at by increasing the tension on the springs which force the idler between the motor shaft and the rim of the turntable. Quality crystal pickups are hard to find now. When they fail, repair is not possible normally. Replacement is the only option. Garrard made some good crystal pick ups with good bass response. No modern match today. Replacement styli are available from great companies such as Musonic. 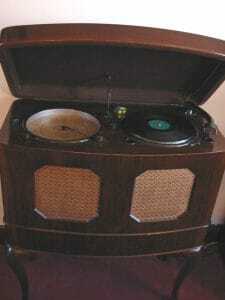 Older 78 rpm decks normally can be restored well. Disk – eddy current motors will need new phase splitting capacitors. Without changing these components, the deck will slow down during loud passages. Pick ups will need their rubber bushes replacing. This is what hot water bottles were made for. Where the output of the pickup is low, the permanent magnet may need to be recharged. A few turns of thick wire and a car battery results in great fun. All controls will be cleaned with a lubricant cleaner. This normally cures 90% of crackles. However where more drastic action is needed, replacement is the only fix. Wave change controls sometimes cannot be fixed easily. In some cases, if the customer agrees, the control is hardwired to the waveband required. Mains on-off switches are worthy of attention. I have seen fires start when switches are worn and stick in an intermediate state. When a control shows signs or high resistance and or intermittent working, a replacement is made or the control is hard wired out of action. The mechanics would normally be checked and the tuning dial accuracy spot frequency checked. Where the tuning cord has broken, a repair will be made. This would, depending on complexity, be quoted separately. 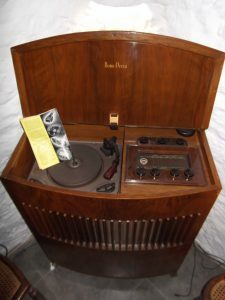 Philips sets were responsible for many an early death of a service engineer. 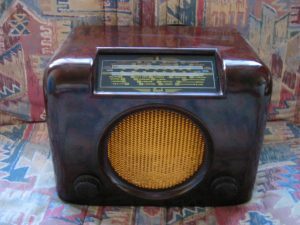 Wire cord was used and some models had a complicated mono-knob control system which was a nightmare to repair. More expensive sets had a magic eye tuning indicator. These valves normally are not material in the operation of the radio. They are there to show the stone deaf when the radio is on station. Personally I love them. However, these little chaps are becoming as rare as the proverbial rocking horse droppings. With age, the fluorescent coating on target electrode fails and the image is only discernable using a Hubble telescope. These valves where available, are changed at a cost. 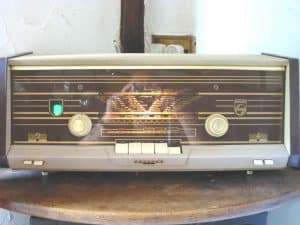 Some Philips, Mullard sets used a magic eye which had an amplifying triode built in, normally being used in the audio stages. Where a failure occurs here and an EFM1 cannot be found, an additional triode valve may have to be added. Don’t condemn the valves if a set does not work! Normally, the components fail or cause the early demise of a valve. With over 3000 valves in stock, replacement is normally possible. Vintage HiFi is popular and certain valves now command a high price. Masses of data plus AVO valve testers are used to check suspects. Check the speaker for cracks and damage cone and repair where possible. Basic clean of the cabinet, removing years of smoke staining. Polish. Replace dial and indicator lights. If required, supply a length of wire for an aerial. Check rating of mains fuse. As mentioned above, the owner would be given a brief report setting out what has been done and any recommendations and observations. Slightly unusual design. 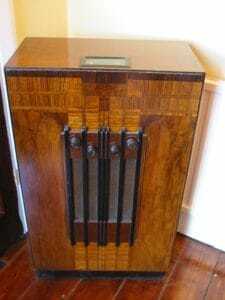 Radio section is straight forward, but the cabinet and dial definitely hark back to shipping days.